Happy Tuesday! 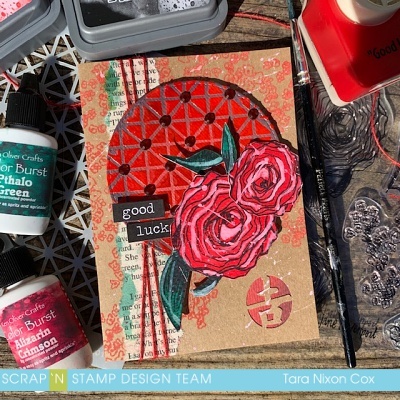 Today I wanted to take a little break from Valentine's Day creations and I was totally planning on avoiding the color RED as well... but when I pulled out this sweet stamp set by Jane Davenport and thought I saw tiny cherry blossoms it led to Lunar New Year (that'd be today!) 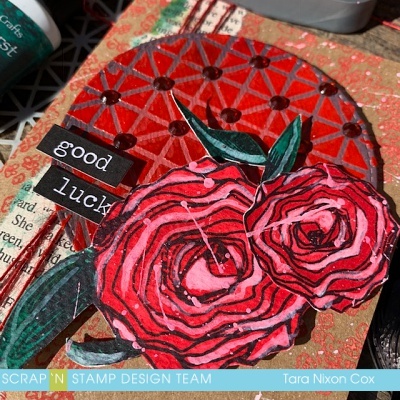 and the next thing I knew I was making a RED floral card with good luck wishes for the new year! I stamped the images on watercolor paper and started some simple coloring using Color Burst as my watercolor medium. It ended up a little bit too monochromatic, so I watered down some white acrylic paint and added a bit of detailing, which mixed with my red to create soft pink highlights. 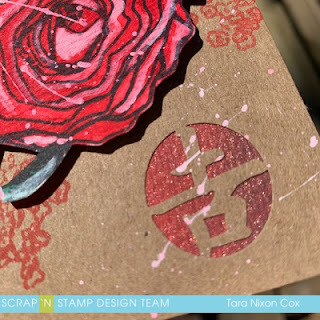 I stamped the small blossoms image in Candied Apple Distress Oxide on the kraft card base (because I just can't get enough of Oxides on kraft!) 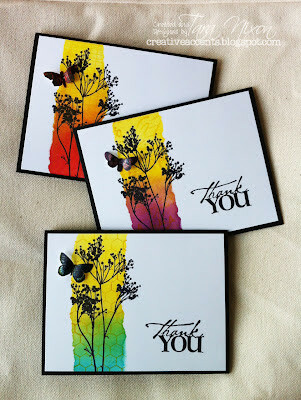 and then splattered some of the remaining white/pink paint on the card background and over the stamped flowers. I had a scrap of book print with some green paint already on it, so I decided to add a bit more green to tie it in with the leaves from my florals, then added it as a strip along the left side of my card, which I wrapped some thin red twine around for texture. I also had a piece of inked up watercolor paper that was red-ish which I die cut from the MFT inside & out stitched circle dies. I pulled out some 3D gloss gel and swiped it over a MFT framework stencil to see what the result would be... turns out it looked fabulous. The clear gloss over the watercolor intensified the color and really popped! I inked the edges of the die cut circle with Black Distress Oxide to add more contrast and really love the results. I added some red bling in some of the open spots of the stenciled design for even more shine & texture. I found a really old punch (from back in the days before dies were affordable) with the Chinese symbol for 'Good Luck' which I added to the lower right corner of my card. 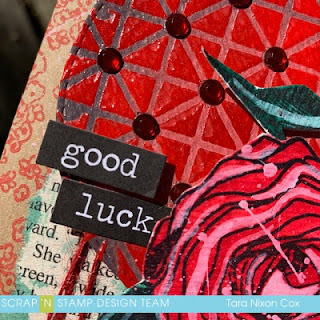 I searched through some Tim Holtz big chat stickers and found the same words in black & white (and English! LOL) I just had to black out the 'y' so it said luck instead of lucky. If your January, like mine, got the new year off to a bit of a rough start... you have my permission (and invitation!) t0 join me in celebrating the Lunar New Year and another fresh start! Good Luck!